While working on the round-up of my 2016 vintage garments, I started thinking about getting started in vintage sewing. Two of my first ever makes were vintage dresses, so I've basically always been interested in vintage sewing and the 50s and 60s in particular. The whole reason I picked up a sewing machine was that I discovered I could buy a sewing pattern from 70 years ago for $10, and make a dress exactly like the expensive ones at the vintage store--but in my size. This was my introduction to sewing!! I was super lucky, though, to have a mom to teach me not only how to use a sewing machine, but also how to use a commercial pattern! 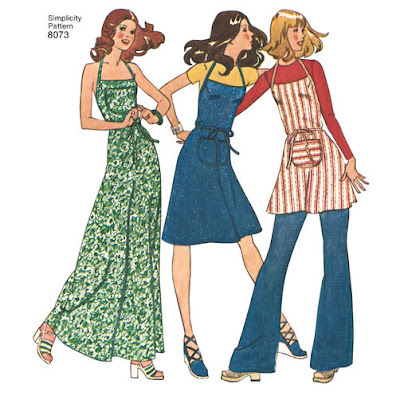 I've rounded up a list of easily-accessible patterns that you should be able to find at any old JoAnn Fabrics, all but the first vintage reprints! These are archived patterns which pattern companies like Simplicity and McCall/Butterick/Vogue (all one company, did you know?) have started reprinting, so they're as authentic as you can get without using a real vintage pattern, which can often be hard to track down in a given size. (You can read my interview with Deborah Kreiling about Simplicity's Vintage line here!) It's organized by increasing difficulty... but I know you can do whatever you set your mind to! There's a reason you would have started with an apron if you took home ec sewing: view E of Simplicity 1934 will only require you to sew straight(-ish) lines if you leave off the sweet pockets, or try tackling the trimmed hearts for a challenge. 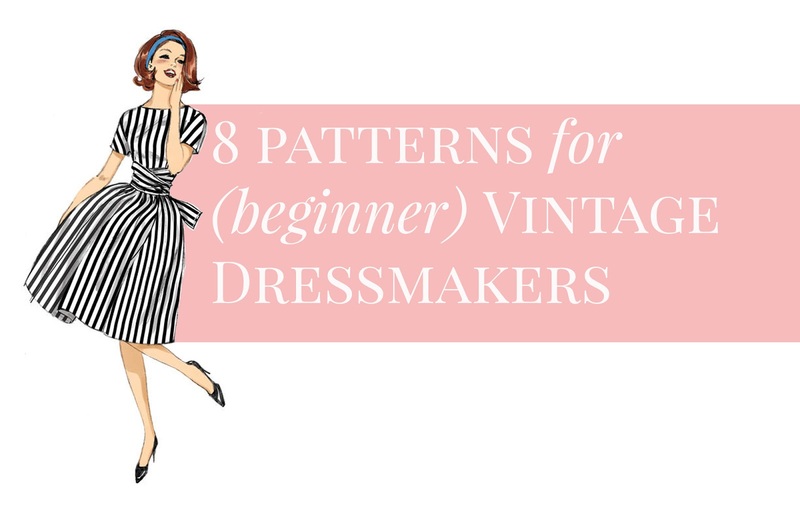 This is a wonderful first project, and despite the fact that it's the only truly "modern" pattern on this list, it will look perfectly at home protecting your vintage dresses... once you've made them! One step up from an apron and solidly in the realm of "real clothes" is this 70s apron dress, Simplicity 8073. With a tie at the neck and in the back, it has a flexible fit and there are no fastenings to worry about if you're shy of buttons and zips. I love the center one in denim! 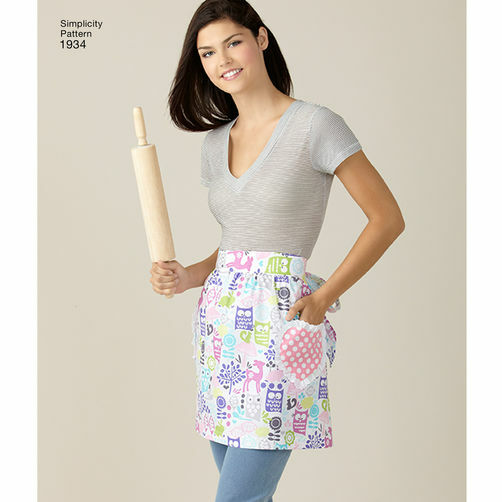 You can always leave the pocket off if it looks too apron-ish to you. Simplicity 1252 (above, in rose pink) and Simplicity 1609 (below, in hot pink) are similar "Jiffy" (meaning simple and quicker to make) shift dresses from the 60s, each "with two main pattern pieces" as the envelopes used to say--excluding facings, of course! Both dresses have center back zippers, fisheye darts in back (darts that don't run off a seam, they start and finish in the middle of the pattern piece) and bust darts in the front, with 1609 having an additional set of darts in the front for a closer fit. As you can see by the difference in looks seen here, both are super versatile: make it in a bold print for a mod look or a solid suiting fabric for an office-appropriate jumper. 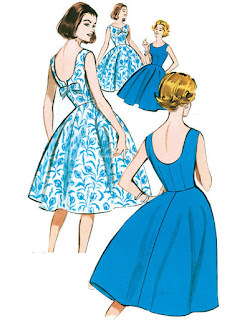 If you want that 50s/60s cupcake look (as you know, my favorite silhouette ever) Butterick has a few entry-level options: Butterick 5748 (the blue one above) is a sleeveless dress with a scoop neck in front and back and a circle skirt. 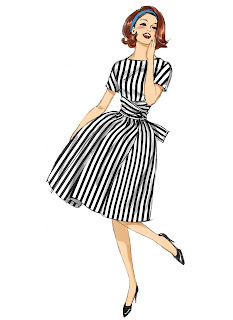 Butterick 6318 (in stripes, and my version in chambray here) has a center back zipper, a gathered skirt, and kimono sleeves, a type of sleeve that's connected to the bodice--no extra pattern pieces required! It also has a built-in sash which you can either use, or leave out for a more streamlined look. These are both basic shapes that you can make over and over, changing the whole look by choosing different prints and textures of fabric! Both are rated easy by Butterick, both have darted bodices, and the most challenging thing being is inserting a zipper. 6318 also involves (lots of) gathering. It will be worth it for that skirt! 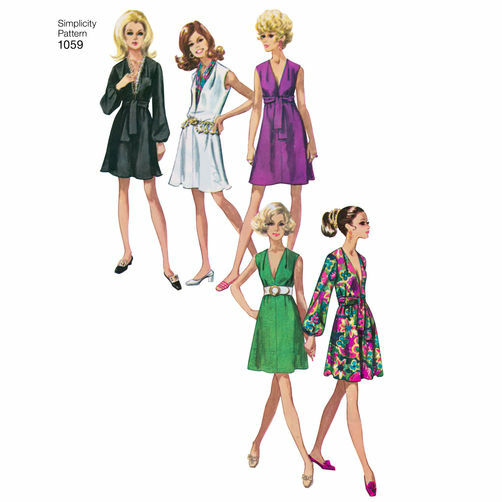 Simplicity 1059 is another "Jiffy" pattern, this time boasting "only three main pattern pieces" (front, back, and sleeve). Although this dress is easier to fit than the shift dresses or full-skirted dresses I chose, I've put it down here in the more advanced section because it will look best in a drapier fabric like a rayon challis, not a stable cotton. It also has optional set-in sleeves--but if they aren't eased in perfectly and have some gathers, it will still look great. 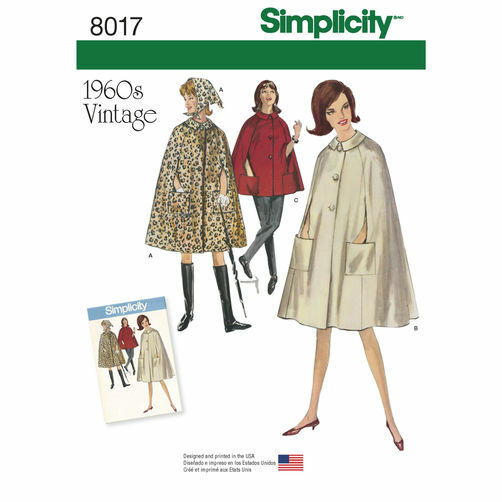 If you want to try your hand at outerwear, a cape like Simplicity 8017 provides a great introduction to coat making, but requires minimal fitting since it basically just drapes over your whole body. The trickiest part might be the collar, but you'll also need to either tackle buttons and button holes, or purchase some sew-in snaps for a sleek look. If you're already somewhat experienced in sewing, but a little reluctant to dive into vintage, you can also read my article on finding inspiration in vintage patterns--and applying them to modern patterns--here! 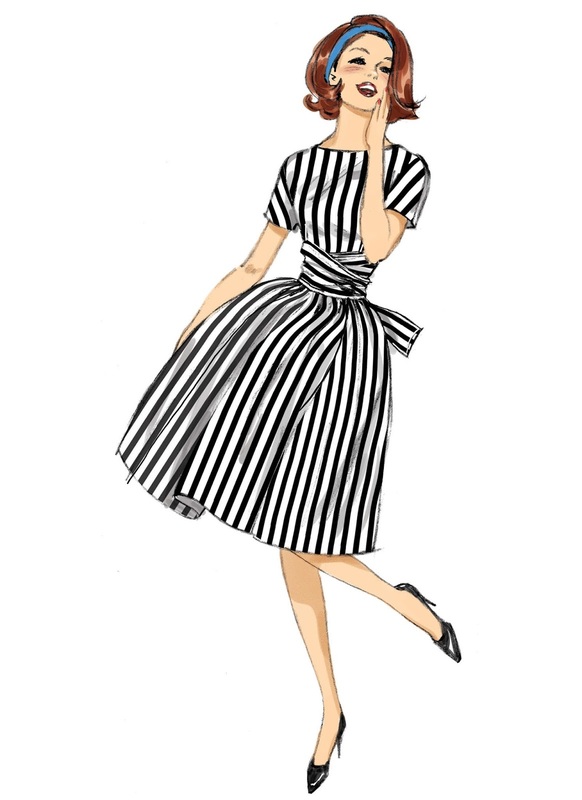 ps: this vogue pattern is the first vintage reprint pattern i made... it was not the best choice for a first dress project, but i wouldn't change it for anything! Great suggestions. I've definitely been nervous about trying vintage (and it's very rare to find my size), but I like these suggestions as a way to ease in. I actually have one of the shift dress patterns. I should actually make it! Thanks for the inspiration! It can be SO HARD to find vintage in the right sizes!! If I'm just looking for, say, a "cocktail dress" I can usually find something in my size but if I'm looking for a particular pattern number it can be tricky. I love love love the ease of using the vintage reprints, especially since they are multi-sized. I have recently been delving into vintage patterns, and have had some fantastic finds for genuine vintage, but also loving the reprints too, and loved your article in Seamwork, the tip to add a deep tuck to look like a crop top is genius! I will have to try that. Thanks for the wonderful article. I will share it with my vintage sewing group on FB.